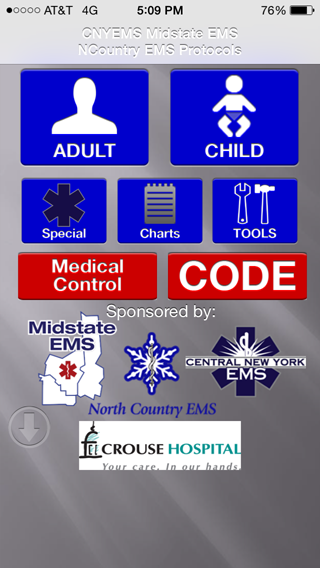 The CNY Midstate North Country EMS Collaborative Protocols App is for Advanced EMT’s who operate under a multi-region collaborative pre-hospital protocol. Essentially a larger area of counties and regional medical committees’ came together and established a common set of EMT protocols and this supported all of the regions. It’s very similar to the SREMS app however I overhauled the UI/UX to be more inline with iOS 7’s flatter design language. I was again in charge of all client interactions and development, as well as porting the protocols into html. As this was largely a modification of an existing code base I was responsible for working with the client to determine the difference and changes needed to support their app. I was also responsible for completely porting the app to Android, resulting in a ground up build of an android app.